Today we’d like to introduce you to Wendy Banks. So many good things have happened to me by chance. Back when yoga was fairly unknown, I considered it weird but intriguing. I had heard of a friend of a friend standing on his head and I wondered why anyone would want to do that. I was working as a Continuity Girl in films in England (that’s Script Supervisor here). We were on location, working a demanding schedule, and one of the camera crew, told me he did yoga and showed me some poses and the sun salutations and made me promise to go to the Sivananda Yoga Center near Regents Park in London. He said it was the best in town and I think he thought I needed to calm down a bit and relax! I loved it, loved how it made me feel and was curious to know more about the philosophy behind yoga. I actually moved into the Center for several weeks to have the discipline of practicing yoga and meditation every day. When Swami Vishnu-Devananda came over to lead a retreat I knew I had to delve into it even more deeply. So I quit my promising career that just wasn’t giving me the fulfillment I wanted. I loved working in movies but doing continuity wasn’t “it,” just wasn’t my passion, though I didn’t know what was. I wanted to do something with my life, something worthwhile, but what? I ended a hurtful relationship that wasn’t going anywhere, got rid of all my clothes and furniture, and finally at the last moment managed to sell my difficult-to-sell car for exactly the amount I needed for my flight to the Bahamas for Swami Vishnu’s Yoga Symposium. After a few months at his ashram there I took two teachers trainings with him at his headquarters in Val Morin, Canada. That year was an amazing experience, to leave everything and just go! I had no plan or goal. I think it was very special to immerse like that – today people do trainings on the weekends around their jobs, or for just a few weeks so I fear their training might be somewhat shallow or superficial. However, it is truly wonderful that yoga has become so popular and that now there are plenty of teachers and a yoga studio on every corner. Teaching yoga as a career was not my intention, I only took the teacher trainings for my personal growth and because I loved it so. However, one thing leads to another, the way life usually works out, and I felt guided, pushed almost. I needed extra money for my son’s gymnastics and someone told me The Learning Tree University in Chatsworth needed a yoga teacher. So initially, yes, I did it for the money! I taught there two evenings a week for a few years until the LTU went out of business (very sad, because they offered a variety of wonderful classes for the community). But it was serendipity for me and inspiration came from my students who insisted I check out a place to rent in Granada Hills, which, amazingly, was available on Wednesday nights. With some trepidation about swinging out on my own, I opened my doors and at my first class, lo and behold, there were 26 people!! That was 18 years ago, January 1999. It’s just grown and evolved since then, it mushroomed and as more people came I added more classes. I also taught at other places, including credit classes in the Kinesiology Department at CSUN (Cal State University Northridge). And I worked at a chiropractor’s office doing therapeutic yoga for people with chronic conditions. So, yoga took over and I no longer had to drive the 405 to my job as Astrological Editor for a publishing company. I think that in our culture we love the Cinderella story, the Rocky, the underdog winning out, the rags to riches and you’re expecting me to say I had a dream of being a yoga teacher and of having my own business and overcame huge obstacles to finally achieve it. I’m sorry if I disappoint, but honestly, it wasn’t like that. The yoga road has been relatively smooth and joyful for me. It does take courage, though, to follow your heart and defy convention or expectations (both other people’s and my own). Leaving London and my whole life there and flying off to the Bahamas and who knows what was scary, but, it called my heart. It was like going toward light, light that pulled me, almost as though I had no choice, I had to go forward. Along the way in my personal life I’ve had many challenges and ups and downs. Setting aside one’s personal issues is a tremendous discipline. I always try to shake off whatever might be going on with me and walk into class clean and present, 100% there for everyone. And I always ‘ask up’ for my guides and teachers to come through me, I try to tap into whatever is needed for people on any given day. Over the years, I’ve been through relationship break-ups, my ex-husband’s death, raising a ‘naughty’ teenager (who turned out just fine – phew! ), and my daughter who was diagnosed with Asperger’s and then had a mental breakdown, but who is doing fantastic now by the way. I had no idea what a psychotic episode was or how to handle it, but that’s another story! For me, teaching yoga gives me a sense of fulfillment. It warms my heart when people say things like they couldn’t have gotten through their terrible summer without my classes, or they’re finally free of back pain, or they could never do what they do with their grandkids without my yoga, or just smile and say a deep ‘thank you.’ I love contributing to people’s wellbeing, preferably on every level, physically, emotionally and spiritually, it is very satisfying. When leading the yoga retreats and vacations, in Costa Rica, Italy, France and England, I felt the responsibility keenly and it was quite a lot of hard work organizing them. It was well worth it as all our trips were tremendously successful. Serendipity was at work again, in how they came about and how each one was a unique, one-of-kind experience, very personal, not the usual tourist thing at all. Always the right people seemed to be drawn together to form a group where little miracles could happen, lots of yoga and lots of fun! One came about, for instance, when I was in France visiting my sister and she introduced me to some friends – I knew they would be wonderful hosts and that I just had to bring my people there, I knew they would love it, it just called my heart. Yoga classes, Restorative Yoga workshops, Meditation classes, Astrology classes. And parties! We’ve had Yoga Retreater Reunions, and Birthday parties – forming new friendships and generally getting together for FUN is great. And we often go for coffee (or dinner) after class. Keep it simple, keep it happy! Quite shy and reserved, “self-contained” my mother used to say, independent. I grew up on a small farm outside a village in the heart of leafy green Sussex, England. There was only one other child living nearby to play with and she was three years older than me, and my sister was four years younger. So I swung from being bossed about to being bossy! I’d quickly get fed up with them and loved hanging out with Albert who milked the cows and crooned better than Bing Crosby. We were always outdoors, squelching in the mud bringing the cows in from the fields, climbing trees, jumping in the hay in the barn, so later, moving my body in yoga came naturally. And I think learning to be independent in my childhood helped me develop the ability to run my own show, so to speak, as a yoga teacher. There was a lot of stability in my childhood and the lush countryside gave me a deep love of nature. I love the climate here in California, but I miss the rhythm of the seasons in England – the haymaking in the summer, the crisp, cool air of Autumn, falling leaves and ploughed fields, the frost and biting winds of winter, our warm breath on the air and bright green leaves of Spring bursting out, the purple crocuses and yellow daffodils. Now in my yoga classes I often weave in colorful imagery to help create an uplifting mood and am drawing directly from those early experiences. My best friend’s family would take me with them on their summer vacations, one was to France. It was such a fun, positive experience I fancy it gave me a taste for travel and exploration. My older sister set an example for me by going to Italy as an au pair girl (which our father considered far too adventurous!) and my brother traveled the world in the navy. Perhaps these influences fostered my yen for travel and exploration, both literally, and philosophically. The philosophical ideas behind yoga, and applying them to one’s everyday life is a lifetime’s study! 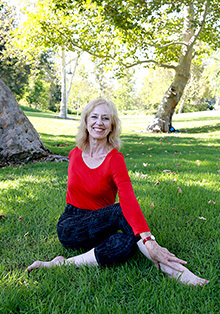 Wendy Banks was one of my first Yoga Instructors in Northridge, Ca.located in a studio behind Trader Joe’s where I shopped weekly in 2000-2006. Since then I retired early to the Sedona area in Arizona …now out of that busy working career in Los Angeles, where I was traveling and keeping up with the students at The Fashion Industry at The Fashion Institute of Design & Merchandising for 25 years. I would have had a nervous breakdown if I hadn’t had my 3 yoga classes every week during all those years to stay sane & calm working in “Road-Rage L.A.” So, with Wendy’s wonderful & kindhearted suggestion, I too became a yoga Instructor for my new career ..not retired …only re-fired… and have followed in her footsteps enjoying sharing my passion to help others find to find peace & tranquility they seek in their lives through yoga for the past ten years and lov’n it! She was a wonderful friend to me and I had opportunities to travel with her to some wonderful yoga retreats in Brazil, Costa Rica & France that I will never forget! She’s a gem!!! Wendy . . . I first experienced your classes at the Y on Tampa & Rinaldi, I knew I loved it but life got in the way. However, I recently found out the I have the beginging of Scliosis and it appears the only remedy is Yoga so I’m going to give it my all. I’m sure any guidance you can provide will be of great value.